For the Lekgolo colony commonly known as the Hunter, see Mgalekgolo. Small worm-like creatures that unify into single entities called "subsistence gestalts"
The Lekgolo are a species of small colonial worm-like creatures that can join together to form purpose specific assemblages, known as subsistence gestalts. Each Lekgolo is an individual organism, about 1.4 meters long, with its own central nervous system. Lekgolo are also able to arrange themselves within machinery and use their combined intelligence to pilot or control it. One of the most successful and culturally enigmatic gestalt intelligences in the Orion Arm of the Milky Way galaxy, the Lekgolo became the first species to be annexed into the Covenant in 784 BCE. The Lekgolo first evolved on one of the moons of the gas giant, Te, and thrived by feeding off the rich metal deposits in its crust. The Forerunners cataloged the Lekgolo in their time, albeit in considerably different assemblages than the ones that would be encountered later on. Lekgolo specimens of the Thanolekgolo configuration were to be used in a failed plan undertaken by the Forerunners to defeat the Flood. A number of these specimens were ultimately buried under the surface of Installation 04 by the Forerunners for unknown reasons. They survived on firing of the Array and continued to reproduce and exist as a population for many thousands of years. Since their combined forms could potentially be highly intelligent, the Lekgolo were able to develop Tier 3 technology on their own, though their space travel capabilities remained highly limited due to the high gravity of their homeworld. At some point following the firing of the Halo Array and their reintroduction to the moons of Te, a number of Lekgolo colonies settled in Forerunner installations orbiting the gas giant. These colonies developed distinct appetites; while many consumed the Forerunner structures themselves for food, others ate anything except Forerunner materials. After several millennia, the Forerunner constructs were almost completely broken down, with the debris forming rings in the planet's orbit. "Our first encounter with the Lekgolo was an effort in futility. The blasphemous creatures had devoured a Forerunner orbital, shattering its remains into a trillion pieces." — A San'Shyuum Covenant scribe recalls the Taming of the Lekgolo. The Lekgolo first came into contact with the Covenant when the alien order arrived at Te in search of Forerunner artifacts in 789 BCE. It discovered that the rings of Te were in fact the remains of a Forerunner orbital construct and soon realized the Lekgolo were responsible for destroying it. The San'Shyuum viewed this as heresy, and declared war on the Lekgolo in what would later be called the Taming of the Lekgolo. Covenant fleet commanders soon found that indiscriminate destruction would have unacceptable consequences: since the Lekgolo largely lived in and among sacred relics that the Sangheili were trying to preserve, simply annihilating the Lekgolo would have resulted in the destruction of those relics. Likewise, carrying out a ground campaign against the Lekgolo proved difficult, as the Lekgolo were able to combine into powerful collectives, most notably the Mgalekgolo; consequently, the Lekgolo won most, if not all, ground engagements. The Covenant's forces were completely overwhelmed by the sheer size, ferocity and teamwork of their foes. As a result, the Arbiter that was created during this crisis suggested that they could be "tamed" and put to better uses as part of the Covenant. The San'Shyuum eventually agreed and decided to forge a pact with the Lekgolo, allowing them to join the Covenant despite their offenses against "sacred" Forerunner artifacts. Despite initial difficulties at contact due to the Lekgolo's alien methods of communication, the Covenant incorporated the Lekgolo into their ranks in 784 BCE. The Mgalekgolo gestalts, armed with thick armor plates and assault cannons, would come to serve the Covenant as shock troops. Even larger Lekgolo colony assemblages were weaponized as Covenant assault platforms, Scarab and the Harvester, the latter of which is operated by a meta-colony referred to as a Sbaolekgolo. Individual Lekgolo worms, specifically conditioned not to ingest Forerunner alloys, were employed by the ascetic priests studying the Forerunner Dreadnought in High Charity. A number of these Lekgolo stopped Mendicant Bias from taking off in the Forerunner Dreadnought by short circuiting the ship's systems, themselves dying in the process. During the Great Schism, the species was divided between those that remained loyal to the Covenant, led by the High Prophet of Truth, and those that supported the sided with the Sangheili at the time. During the further conflicts in the wake of the Human-Covenant War, the Lekgolo largely stayed with the Sangheili they had served prior to the Great Schism. A number of these colonies would side with the Swords of Sanghelios, and many would end up fighting alongside the UNSC on occasion. However, many would fight on behalf of other Covenant remnants, including Jul 'Mdama's new Covenant order, Vata 'Gajat's mercenary group, and the Banished. After the destruction of Installation 04, feral Thanolekgolo swarms that had been sealed beneath the ring's surface by the Forerunners were able to break free in certain sections of the ring, namely Alpha Shard, a fragment propelled through slipspace into a close orbit around a red giant. Because of their extremophilic nature and ability to burrow underground, the Lekgolo were able to survive on the fragment for years despite the extreme daytime temperatures. These Lekgolo were highly aggressive, and significantly faster and more agile than their more commonly-encountered brethren. During a joint ONI-Sedran Colonial Guard expedition to Alpha Shard, these Lekgolo swarms hunted and consumed almost the entire group, leaving only two survivors. They were killed when Colonel Randall Aiken detonated a HAVOK tactical nuclear weapon to destroy the shard's deposits of a new element fatal to humans. A swarm of Lekgolo overwhelming a D81-LRT Condor. The Lekgolo are characterized by their ability to form bonds with one another both physically and neurologically to form gestalt colonies with a singular personality; these communities, rather than individual Lekgolo eels, are considered the closest thing to a sapient Lekgolo "individual" that can be named. Lekgolo are relatively unintelligent at the most basic level, but can form complex thoughts and emerge as a conscious individual when they combine into larger masses that communicate through chemical and electrical means. A colony's level of intelligence is generally dependent on the amount of neural mass present, and can be scaled upward to a certain extent for increased intelligence. The neural net that a Lekgolo colony develop enables them to be incredibly strong and very sensitive to their surroundings. These gestalts are capable of manifesting in several different forms according to what goal they are striving to achieve and the amount of Lekgolo worms that are present. The Covenant was aware of six different forms of Lekgolo colonies: Dipholekgolo, Mgalekgolo, Rhulolekgolo, Sbaolekgolo, Khantolekgolo, and Thanolekgolo. Each of these gestalts differs in size, mass, and complexity. Because of the nature of the Lekgolo's compound intelligence and consciousness, they cannot be easily assimilated by the Flood, for while each individual worm may have its own central nervous system, the subsistence gestalts do not, and co-opted worms were never able to be used by the Flood to form the gestalts they would otherwise have. The Flood can still certainly use Lekgolo for their biomass, however. The Lekgolo are xenobiologically classified as a "subsistence gestalt", defined as an alien gestalt community with the ability to survive in extreme conditions, including the vacuum of space, for months or even years with barely any to no outside resources. As such, they were able to survive in Te's orbital rings for vast periods of time. However, Lekgolo are still unable to withstand rapid depressurization. Lekgolo blood is a luminescent orange and smells like burnt plastic. This may be a result of a large iron content, seeing as metals are a fundamental part of Lekgolo diets. Subsistence gestalts arise from the aggregation of many individual Lekgolo. Distinct Mgalakgolo specifically form from a single large colony splitting in two, with their dorsal spikes containing the remnants of the last connections between the two parts of the colony. 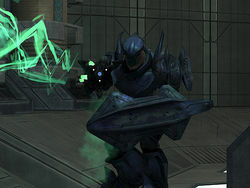 A Mgalekgolo fighting in a Forerunner structure on Installation 00. Little information exists on the internal workings of Lekgolo society, and their political and intellectual structures have been subject to many theories. Most of the information on the Lekgolo is based solely on the Mgalekgolo, which provides only a small hint at the species in its entirety. The Lekgolo almost never associate or even communicate with the other races in the Covenant. Sangheili are the sole exception; the Mgalekgolo appreciate and acknowledge the Sangheili warriors' thoughts and adeptness in combat. To the other races of the Covenant, however, the Mgalekgolo are dismissive, scornful, and arrogant, and they are utterly contemptuous of their foes. Mgalekgolo have no qualms about committing friendly fire against the "lesser" races, like Unggoy and Kig-Yar; during the Battle of Sigma Octanus IV, a Hunter was seen running over and killing an unaware Kig-Yar. In battle, Mgalekgolo will attack foes regardless of any allies that happen to be in their line of fire. Many members of the Covenant are mystified and confused by the Lekgolo; their way of life is almost as alien to the Covenant as that of the Flood. A Sangheili Fleet Master once noted that Mgalekgolo were known to tear opponents apart with their "bare hands" whilst in a blood frenzy, and then suddenly pause to recite war poetry. It has also been said that Mgalekgolo meditate in their spare time, or before battle. The most commonly seen variety of Lekgolo are the Mgalekgolo, hulking bipedal forms used for service within the Covenant military. In this form, they are the strongest and most resilient combatants in the Covenant. Much larger bipedal Lekgolo assemblages that could easily be measured in stories have also been observed, but they are uncommon within the Covenant; the largest known Lekgolo forms reside within the armored shells of Covenant Scarab and Harvester walkers, the latter being known as a Sbaolekgolo. The Lekgolo were the most plentiful members of the Covenant, numbering in the trillions. Lekgolo religious beliefs are poorly understood, though it has been noted that their society in itself has little need for religion. While the Lekgolo joined the Covenant for its access to space trade routes and starships, rather than any real dedication to the Great Journey, at least some hold a concept of an afterlife. Many Lekgolo colonies meditate in their spare time, or recite war poetry before or after battle, showing a more refined nature than would be believed of the hulking, savage warriors. Mgalekgolo have also shown to possess a concept of honor. The fact that some Mgalekgolo allied themselves with the Sangheili during the Great Schism, while others remained with the original Covenant body, is evidence that individual beliefs play a major part in whatever religion or philosophy the Lekgolo possess. Anything further than this is speculation, as Lekgolo culture is extremely reclusive. Even their fellow Covenant know little about them other than that they continue to follow their own cultural traditions, rather than the homogenized religion of the wider Covenant. Little is known about the Lekgolo language. The known names of some Mgalekgolo seem to imply that they use very simple vowels, and few consonants—not nearly as many as are contained in the English alphabet. It is known that Mgalekgolo do not use vocal chords to speak; they are, however, capable of mimicking the language of other species via subsonic vibrations of the Lekgolo in their bodies, forming words and sentences that are "felt rather than heard". Their quiet nature amongst other races of the Covenant results either from difficulty speaking with other Covenant races or difficulty tolerating other Covenant races. For inter-species communications, Mgalekgolo are capable of speaking at least the Sangheili language, and are not known to interact with any other sapient species. Individual Lekgolo also occasionally make vaguely insectile clicking and chittering noises. Mgalekgolo tend to make very deep, low rumbling noises when detecting enemies or when wounded. When dying, they occasionally emit a low-pitched scream. They also seem to chuckle after a kill. When angered, Mgalekgolo are also capable of releasing a loud, echoing roar. Aside from that, Mgalekgolo barely talk. Lekgolo originated from the rings of Te which formed after the worms demolished a Forerunner orbital. The rings and the planet's moons were home to approximately 1.98 trillion Lekgolo worms. Te is orbited by 25 moons, including Rantu and Uhtua. The planet has a high gravity and an atmosphere primarily composed of nitrogen, helium, and methane. The Lekgolo share many similarities with the alien species known as "Brothers" from the 1992 novel Anvil of Stars by Greg Bear, who coincidentally later wrote the Forerunner Saga. Both are eel-like creatures which are non-sapient by themselves, but can join together to form intelligent gestalt assemblages with their own individual identities. A species of caterpillar native to the Amazon rainforest exhibits behavior considerably similar to the Lekgolo. They gather into large gestalt formations which act and move in perfect unison for increased speed and efficiency. In Halo 3, Scarabs are controlled by the Lekgolo, proven by the fact that they appear around the reactor of the vehicle. They also make up the joints of the legs of the Scarab. Upon shooting a Hunter in Halo 3, a Lekgolo worm will fly out of the main colony, wriggle, squirm, and then disappear, as if it is going underground; the Lekgolo probably vanish due to technical reasons in order to avoid framerate problems. On the Halo 3 multiplayer map Assembly, an "aquarium" filled with Lekgolo waiting to be integrated into a Scarab can be seen. A group of Lekgolo in a Scarab. A Hunter, one form of gestalt formed by Lekgolo. A Type-47B Scarab, the largest known example of a Lekgolo colony. Exposed Lekgolo worms in a Mgalekgolo's back as seen in Halo 3. Lekgolo blood. Note the luminous properties. A larger form of Hunter in The Duel. Exposed Lekgolo worms in a Mgalekgolo's back as seen in Halo: Reach. An individual Lekgolo worm in Halo 4: Forward Unto Dawn. An individual Lekgolo worm in Halo: Nightfall. A swarm of Thanolekgolo devour two horses on Alpha Shard in Halo: Nightfall. An individual Lekgolo worm from the Halo 2: Anniversary Terminals. Lekgolo coalescing into Mgalekgolo to battle an Arbiter. Lekgolo in Halo 2: Anniversary. Lekgolo forming a Mgalekgolo to combat Blue Team in Halo 5: Guardians. Lekgolo forming into Mgalekgolo during the Battle of Sunaion in Halo 5: Guardians. Lekgolo in an assault cannon. Lekgolo in Banished caltrops during the Battle of Installation 00 in Halo Wars 2. A Lekgolo filled caltrop near an Outpost. Lekgolo filled caltrops on Installation 00. ↑ 24.0 24.1 Halo: The Flood, "Chapter ?? ", page ??"